If I asked you to figure out how many people on your block (about 20 homes) had visited Disneyland in the last year, you might decide to go door-to-door and ask. But if I asked you how many people in your state had visited Disneyland in the last year, that particular strategy wouldn’t work. That’s the thing about scale. Even the same exact problems become really different problems as you introduce massive amounts of data. I give people this example all the time when we talk about how hard it will be to keep doing the things we’re already doing, at scale. By now, there’s a good chance you’ve heard of Kissmetrics. You may have also heard of Mixpanel. And you can add other names to the list like Amplitude. All of them help you by getting you insights about what people are doing, either in your application or on your website. What if you push too much data to their platforms (and databases)? What if you want data about an event that you didn’t register? That last question can be really frightening. Amplitude, Kissmetrics, and for the longest time Mixpanel, all work the same way Google Analytics does – where you have to go in and define an event in order for their systems to capture and track data about it. But what happens when you don’t know what you don’t know about what you should be capturing? Years ago a few friends and I built a procurement SaaS for mobile phones. It was a more complex time back then, at the introduction of digital networks (rather than analog ones). No phone carrier had nationwide coverage, and this was an opportunity for us to build a comparison and purchasing platform for corporations who had offices around the country and a staff that were using mobile devices. One of the most challenging dynamics was the storytelling inside the organization that drove our product development. As you know if you’ve read other posts here, I’m a storyteller. It’s a core part of how I build products, manage people, and speak to large audiences. And when it comes to building a product, the story you tell about your prospects and your current customers matters. It matters because it shapes the pains you’re trying to solve. It matters because it shapes how you build features, so that you can tell the most compelling version of these stories in your marketing material. The challenge for us was that two of use were telling one story, one of us was abstaining, and the fourth was telling a different story. Now, before you wonder how exactly any of this relates to behavioral analytics, data tracking, issues at scale, or anything else, let me just say this. The winner of any storytelling war is the one who can tell the story with data. Real data. Facts. Not just anecdotal stories that you keep repeating in order to enshrine a particular narrative. But our problem was that we had no data. And every time we went back into our SaaS to instrument the product and collect new data, we’d have to wait. We’d wait for weeks to collect enough, only to find out we needed more data, different data, to follow thru and adjust our hypotheses. Why do I love Heap Analytics? The other platforms make you do the same things my co-founders and I had to do. Define events. Hope you define the right ones. Then wait. You collect data so you can go back and look at it later. So why do I love Heap Analytics? It’s simple. I don’t have to define events. I don’t have to hope that I have figured out which factors will be critical in understanding what’s going on. I don’t have to wait for the data to be collected in order to find out I was wrong. Heap Analytics collects all the data from the very beginning. So if you don’t know that you needed to collect a data point, you don’t have to worry. It’s collecting ALL the data points for your later use. Heap Analytics let’s you look back in time. Ever wonder if a change you made recently had the impact you hoped? What do you do? You make a change and then you see if things are better. But then you want to go back and look at historical data. But on most platforms you may struggle if you didn’t think to capture all that historical data before your new big change. But with Heap Analytics you can look back in time as far as to the day you first started collecting data. Heap Analytics doesn’t charge you per event. A lot of the platforms charge you for each click. Heap is priced by the number of visitors you have. So once they reach your site or application, they can click as much as they like, and you’re not getting charged for each click. Heap Analytics can capture departing events by url. As a blogger that uses affiliate links, I know that when I recommend Beaver Builder, I’m going to use a specific url (that link back there – and by the way, it’s an incredible product and the best page builder for WordPress). Heap let’s me define that outgoing link click. Then, I can have Heap show me the pages where that link has been clicked the most on, for any time period. If you’ve written 20 posts that have links to a recommended product, it’s hard to know which one is doing well (or how well each page is doing). Heap solves that for you. 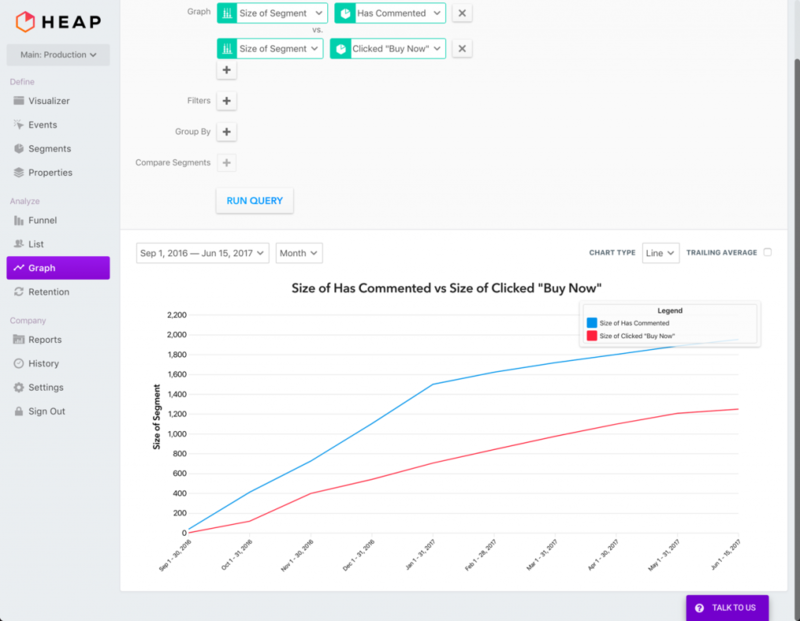 Heap Analytics lets you hypothesize and evaluate cause and effect. This is my favorite features. Let me show you what I mean. In earlier versions of my site, there was a pretty tight correlation between people who commented and people who made a purchase. It was because people were reading an article, and then on the article they might make a comment, and then from there, they’d go buy an eBook. So a year or two ago, I could tell you that from 1000 visitors I knew how many would comment (by percentage), and then from there, how many people who were more engaged and had more trust – how many of them – would make a purchase. But then I started rolling out courses. Did the same effect happen? I thought not. But my friend thought so. So we went to Heap to answer the question. Mind you, we had nothing about this tagged already. So what we did was create a segment of people who had clicked on the “buy” button. And we created a segment who had commented. Then we charted it. Over time, some 1,200 people had made purchases, and just over 2,000 had commented (over this period of time). You might think, yup, that’s to be expected. Not every person who comments will make a purchase. That’s not a hard one to predict. But the curves look like they’re in nice alignment. But it was time to push in deeper – like anyone could do. I removed one of the segments and then added a filter (“those who have clicked on ‘buy'”). Suddenly it was clear, the new courses I had rolled out were not being sold to people who were commenting. Of the purchasers, only 8 had left a comment on a post. It was really clear that the link between the two was no longer part of a causal chain I had to worry about. 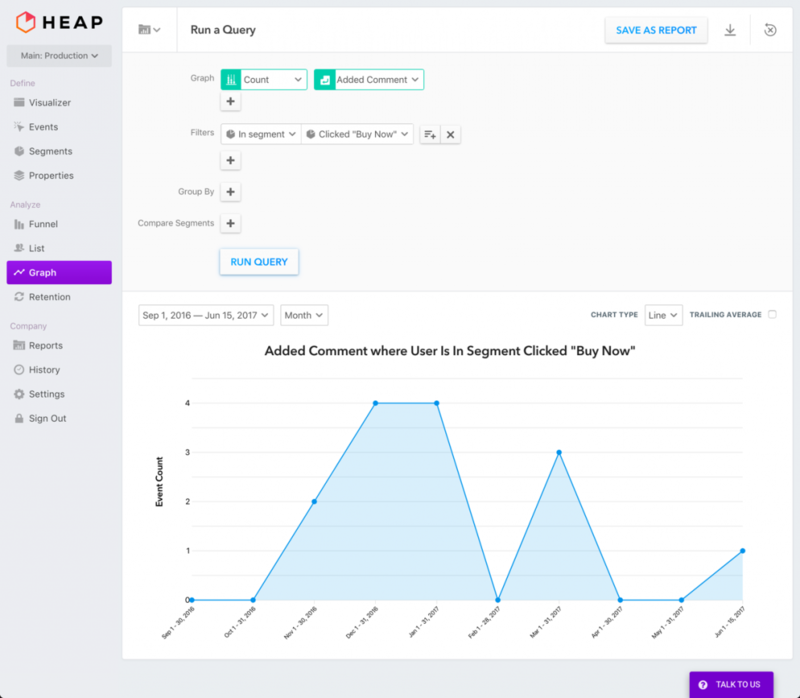 Unless you’re already running a wildly successful blog or SaaS, the best news of the day is that Heap Analytics starts off free. You get a small set of visitors to come to your site for free and you can track it all. You can test everything about their platform. Then, if you want to put their badge on your site (like I did), you get up to 50,000 sessions. And that may be all you need. That reason (free under 50,000 sessions) should be enough. But let me give you the one that I embrace. I don’t know what I don’t know. I don’t know what data I’ll need. And I’m impatient. So waiting for data collection to work just makes me more frustrated. Here’s the best reason to embrace Heap Analytics. They don’t hold your ignorance or impatience against you. They take it in stride because they’ve collected all the data you could ever want and are ready when you are to evaluate it. So go check out Heap Analytics.